We have two boys looking for a forever home. A 5 years old yellow boy and a 2 years old chocolate boy. They are well socialized with other dogs and with kids. They can also go together to the same family, seeing they are living together. We are only looking for families living in Tuscany. 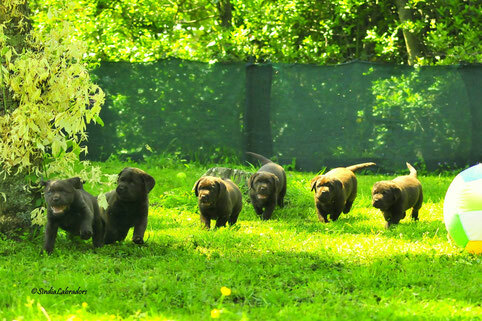 The best time for our puppies to leave to new owners is between 7 and 8 weeks old. The time spent with parents and litter mates socialize them, which is important for their character and their typical attidutes. All puppies are home raised with a lot of love and care. Around day three we begin early stimulation exercises to stimulate puppy's neurological system. This stimulation offers documented benefits for puppy's development and intelligent. We introduce puppies to wide variety of surface, inside and out the house, lots of noises and different smells. Puppies are dewormed, vaccinated and id-microchiped. We are always ready and happy to give advices, informations and help concerning puppy to the new owners. We like to stay in touch with the new families of our puppies for all their lifetime.